Whatever you may wish for as a project manager, the reality is that you have to work with the project sponsor you are given. This book offers project managers a range of practical techniques to get the best out their project sponsors. It also demonstrates the value a good sponsor brings to projects and to the businesses he or she serves. From the project sponsor’s point of view, dealing with projects and project managers is not always easy. Often—very often—project sponsors will have received no training or support for their critical role. This book lays out clearly and straightforwardly what it means to be a good sponsor and how to work efficiently and effectively with a project manager. Many speak of the “accidental project manager,” but the reality is that the current generation of project sponsors can also be considered accidental project sponsors. Although they may not have any background in project management or project-based activity, having reached a senior level within their organization based on other achievements, they have assumed that role. Remember that there is not currently an official body of knowledge for project sponsors to help them understand best project management practices. And finally, these days more than ever before, the projects that executives commission are critical to the strategic growth of organizations; those executives demand and expect the highest level of success. 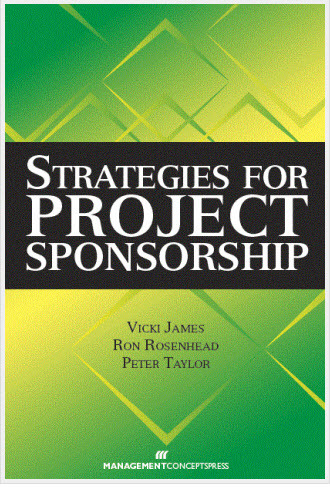 This book explores the important part that project sponsors can and should play in project success and why executives need to take the sponsorship community within their organizations to the next level by investing in support, development, and guidance. Strategies for Project Sponsorship is based on research across all three communities: project managers, project sponsors, and executives. We are experienced project managers who know first hand not only what it means to work with project sponsors but also to be a project sponsor working with project managers. Through our own experience and research in project management, we have identified a gap in the focus of effort in the area of project sponsorship. Much has been done, and continues to be done, within project management, but the key role of project sponsor has been sadly neglected to date. Strategies for Project Sponsorship explores the challenges of working with and being a project sponsor from the various viewpoints of project managers, project sponsors, and organisations undertaking project-based activity to support their strategic visions. The book provides examples from real-world experiences, as well as tips, techniques, and tools to help you get the most out of your project sponsor (or the project manager for whom you are serving as project sponsor). We begin by defining good project sponsorship and considering roles and responsibilities—who does what and when. We then turn to the project manager’s view: how to understand the project sponsor you have, how to work most effectively with project sponsors with different approaches and styles, how to develop the right relationship between the sponsor and the project manager, and what roles each should undertake. We also expand the discussion of sponsor management techniques to all stakeholders. For the project sponsor, we address how to become a sponsor in the first place, how you may have “accidentally” assumed the role of sponsor, how to enhance your skills to become the best sponsor you can be, and what key duties a project sponsor should assume. And finally, from the organisation’s point of view, we discuss how executives should encourage and support the sponsors within their organizations, and why should they consider project sponsorship advantageous to their business strategy. Throughout this book we provide tools and guides that we hope are readily useful and of practical value to you in your project management and sponsorship work. If you have some ideas to add to this list or ways to improve on what we suggest, we encourage you to contact us at www.strategies4sponsors.com and share your experiences.